Eva Grubinger, Crowd, 2007. Tensabarriers and paint. Courtesy of the artist. Installation view, Berlinische Galerie / The State Museum for Modern Art, Photography and Architecture, Berlin. © 2009 Artists Rights Society (ARS), New York/VG Bild-Kunst, Bonn. CHAMPAIGN, ILL.- Unofficially sanctioned corporate malfeasance, pre-emptive wars, torture, misinformation, government-sponsored spying and other routine assaults on civil liberties. None of the above paints a pretty picture of life in the 21st century. And yet, Judith Hoos Fox and Ginger Gregg Duggan, the curators of the exhibition Under Control, which opens Oct. 23 at the University of Illinois Krannert Art Museum, believe these activities and practices have inspired and spawned some provocative art-making over the course of the past decade. As usual, artists are the ones out there being prescient and reflective, Fox said. She and Duggan, who work together as a team called c2 (curatorsquared) and have curated past exhibitions for the U. of I. museum, are presenting some 30 works by 16 of the worlds most perceptive and compelling contemporary artists. Through the work assembled  which includes paintings and drawings, video, animation, sculpture, installation and multimedia work  the curators hope to engage gallery-goers in a visual and intellectual exercise focused on questioning the origins and motivations of power and control in our culture. The artists whose work is represented in Under Control slip into the proverbial smoke-filled back room to question or reveal where control lies, Fox and Duggan write in the introduction in the exhibitions companion catalog, designed by Studio Blue, Chicago. While artists ranging from Hans Haacke to Barbara Kruger have visited the subject of control in the past, the curators noted that these earlier generations of artists tended to be more concerned with power and control from the perspective of how it pertains to individual identity. Fox and Duggan have shifted the current discussion to investigate the motivations and policies of governments, political organizations, corporations and other organized power structures that seek to restrict or otherwise oppress individual thought and behavior. Fox said the idea for organizing the exhibition goes back a couple of years. Among the works in the exhibition that illustrate the national preoccupation with elections and the democratic process most directly is a 35-minute, continual-loop video by the Spanish performance-art duo Los Torreznos (Rafael Lamata and Jaime Vallure). While much of the work in the exhibition has a serious underlying theme, several pieces  including the Election Night  also use a tongue-in-cheek approach to deliver a message. Humor also is present in South Korean artist Jeon Joonhos The White House, a computer animation consisting of an enlarged projection of the reverse side of a $20 bill. As the animation unfolds, viewers observe a small figure approaching the nations symbolic home with a ladder. The figure climbs up the ladder and begins to systematically cover up  or white-wash  the windows of the White House. On the more sober side are two paintings by one of the exhibitions arguably most recognizable artists, Jenny Holzer. Her large-scale, oil-on-linen paintings depicting declassified government documents replicate actual memos down to the smallest detail. In Detainee Summary 2, nearly every word on the document has been redacted. From a distance, the resulting piece resembles a black-and-white abstract painting. 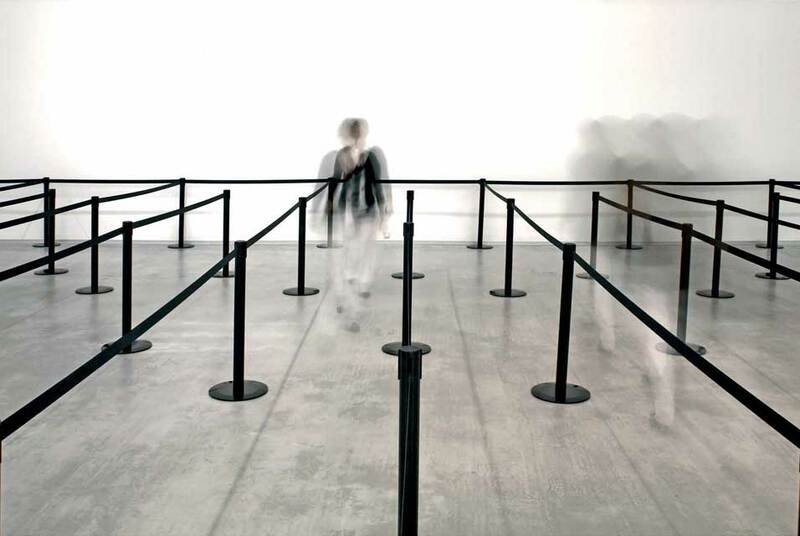 Perhaps the most familiar form of government and institutional control for many who view the exhibition will be Eva Grubingers installation Crowd. It features those ubiquitous crowd-control devices called TensaBarriers, which are most prominent at airports, theaters, banks and other public venues. While the artists exhibiting in Under Control most definitely communicate a point of view, Fox emphasized that the exhibition itself does not editorialize nor project prescribed perspectives such as right vs. wrong, or right vs. left.